The Aruba Marriott Ocean Club is located on beautiful Palm Beach and offers deluxe guestrooms and luxurious one and two bedroom villas. 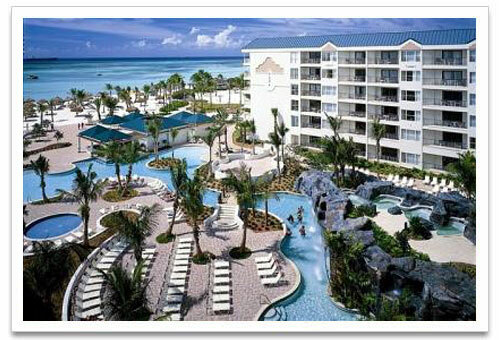 The Ocean Club has a fabulous outdoor free form pool with a waterfall and whirlpool spa. The guests also have access to the luxurious amenities at the neighboring Aruba Marriott® Resort & Stellaris® Casino and the world-class Mandara Spa. There is a Fitness Center, a Kid’s Club, a video game room, and nearby golf. This resort also has a tennis court, basketball court, ping pong and billiards. The guests can also enjoy shuffleboard, and volleyball. This resort has shops and access to a variety of restaurants and lounges. The luxury one and two bedroom villas in Aruba Marriott Ocean Club offer fully equipped kitchens, separate living & dining areas, TVs with DVD players, private balconies and can comfortably accommodate up to eight guests. The spacious one bedroom has one bath and the two bedroom villa has two baths. The master suite has a king bed, whirlpool tub and a separate shower. The kitchen is fully equipped and has a breakfast bar. The unit has a separate dining area and living room. Each villa has cable TV in each bedroom, and DVD player in the master suite. There are oceanfront and oceanside views from each private balcony.